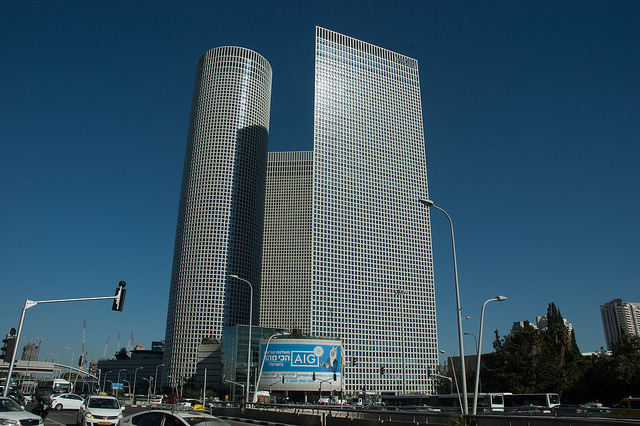 Azrieli Group will build a new green park near the site of its Tel Aviv landmark 3 buildings, the square, triangular and circular tower. Work is beginning on the fourth elliptical tower. The elliptical tower will also contain hundreds of housing units in its 80 floors. The new tower will be on the site of the former Yediot Aharonot building (where I once worked) where the neighboring area will also be reclaimed with other new projects. There is also a projected ‘green park’ and which Azrieli will build in exchange for the tower complex which will cover a section of the Ayalon Highway to create an urban park. The portion of the Ayalon freeway which is slated to be covered with a dome is bordered by Yitzhak Sadeh Street in the south and Arlozorov Street in the north. It will comprise about 15 dunams. The new park area will be encompassed by dozens of new towers and will include cafes and sports complexes will likely be built in the park. The inspiration for the establishment of a green park over the Ayalon came to the steering committee from similar projects abroad such as Park Avenue, the High Line Park in New York, Miami Beach Park, the Big Dig project in Boston and the London highway covering project. I am a practising licensed real estate broker in Israel for 14 years, also licensed in the USA for 7 years. A fluent Hebrew speaker American Israeli and expert in real estate trends in Israel. © K. Sharett and Road Runner Gourmet, 2008-2012. Unauthorized use and/or duplication of this material without express and written permission from this blog’s author and/or owner is strictly prohibited. Excerpts and links may be used, provided that full and clear credit is given to K. Sharett and Road Runner Gourmet with appropriate and specific direction to the original content.